The perfect gift for anyone who enjoys gin and tonic. This gift includes a beautiful rose plant in an exquisite zinc pot. We have paired this plant with a refreshing gin & tonic scented candle as well as a bottle of Elegant Gin (5cl) and a bottle of Fever Tree Premium Tonic Water (275ml). The gin selected for this gift is of the very highest quality and made from 48 varieties of cider apples grown in orchards that have been flourishing for 200 years! This gift is both thoughtful and impressive. 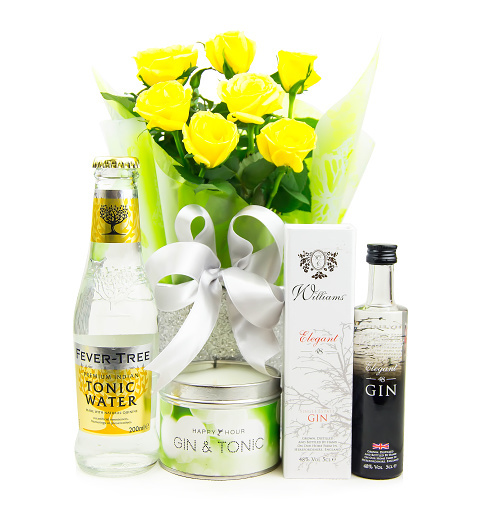 Perfect for birthdays, congratulations, and all other occasions, any gin lover will adore this gift!